A dynamic personality in the Aspen Food and Wine scene, Mawa McQueen first moved to Aspen, CO in 2002 to join The Little Nell team. She worked with a variety of catering companies, and then opened M & M Catering which evolved into Mawa’s Kitchen. Mawa’s Kitchen grew from Mawa’s desire to make delicious, wholesome food more accessible to the people of Aspen. She provides private chef services, cooking classes, event staffing and catering, as well as a cafe! 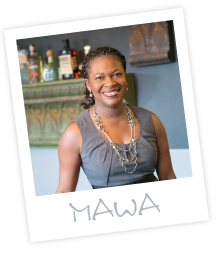 Mawa is a creative and forward-thinking individual with a flexible approach to hospitality service that makes her unique in the industry. 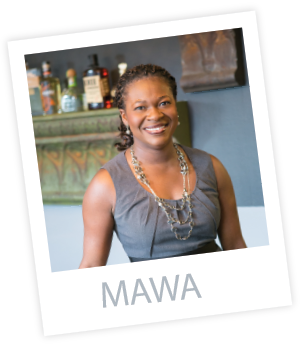 Originally from the Ivory Coast, Mawa was raised in Paris, where she earned her degree in Hotel and Restaurant Management. In England she worked as an Assistant Restaurant Manager and Food and Beverage Manager. After moving to Maine she was a member of the opening team of the upscale restaurant, Stripers, and worked at the White Barn Inn, where former president George Bush, Sr. and family were delighted by her service.